Catch up on everything new in G Suite for Education from September 2018, and see great ideas and resources! 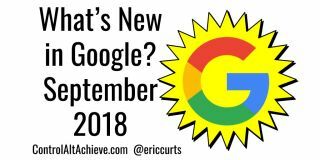 Below is the recorded video from our September 2018 Google User Meeting, along with the meeting agenda and all the awesome resources and G Suite updates from the last month. This includes 18 new Google updates and 23 Google resources for your class. Note: If you would like to see each of the agenda items with links directly to those spots in the video, open the video using the YouTube link below and then click “Show More” below the video. You can view the full Google Document agenda with links to all the Google Apps updates from the last month, as well as all the resources covered in the meeting in the Google Doc linked below. Google User Group schedule - https://sites.google.com/view/geg-ohio/monthly-meetings.